Editroid is a Metroid level editor that allows you to edit map and room layout, palettes, item locations, and much more. Editroid can also expand a ROM to accommodate larger and more detailed maps and even animated background tiles. For more advanced users, Editroid includes a built-in assembler for both general purpose ASM hacks as well as screen-load routines that can modify the behavior of rooms in ways that simple data editing can’t. Version 3.7 allows you to add multiple ASM files to better organize more complex projects. For more information about Editroid, see the website. I first started using Editroid back in 2011, version 2.1. I've watched it evolve over the years into what I would argue is the most superior NES ROM editing utility available. I honestly don't know of any other NES ROM editor that is as feature rich as Editroid. The creative freedom granted by Editroid is vast. Others looking to produce a quality game hacking utility should look to Editroid for inspiration. Editroid continues to evolve as we see the next release on the horizon bringing new and exciting features including ROM expansion to MMC3, a clever CHR management system which can be used to create complex animations or simply to cycle between addition graphics for greater environmental diversity among others. I highly recommend Editroid for all your metroid hacking needs, order in the next 30 minutes and receive a second copy of Editroid absolutely free... (supplies may or may not be limited, operators are not standing by) DOWNLOAD NOW!!! 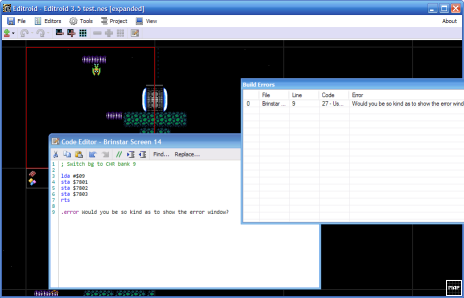 A powerful editor for NEStroid that anyone looking to hack the game needs. This is something you should have in your collection in general, because everyone needs a piece of snarf in their lives. Simply put: Editroid is the reason i started hacking in the first place. If you didn't, give it a try and design your own Metroid playground, it's a blast!